Recently released iOS 7.0.6 Firmware (Build: 11B651) hasn’t been patched by Apple, so now its possible to Untethered Jailbreak iOS 7.0.6 Firmware Using Evasi0n7 Tool. Team evad3rs has officially releases its latest Evasi0n7 v1.0.6 for iOS 7.0.6 firmware, With the official version of Evasi0n7 v1.0.6, its now possible to Untethered Jailbreak iOS 7.0.6 Firmware on iPhone 5S, iPhone 5C, iPhone 5, iPhone 4S, iPhone 4, iPod 5G Touch, iPad Air 5G, iPad 4G, iPad Mini, iPad Mini 2, iPad 3G and iPad 2G devices. Extremely straightforward working process to Untethered Jailbreak Apple iOS 7.0.6 Firmware Using Official Evasi0n7 v1.0.6 Tool is available for Mac OS X and Windows users, So let's start the Tutorial and Guide on How to Untethered Jailbreak iOS 7.0.6 Firmware for iPhone 5S, iPhone 5C, iPhone 5, iPhone 4S, iPhone 4, iPod 5G Touch, iPad Air 5G, iPad 4G, iPad Mini, iPad Mini 2, iPad 3G and iPad 2G Using Official Evasi0n7 v1.0.6 Tool on Windows and Mac OS X.
Download Apple iOS 7.0.6 IPSW Firmwares. 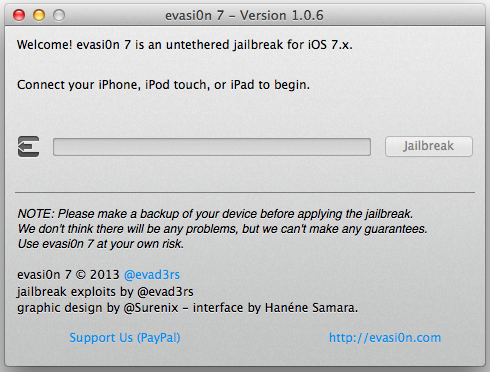 Download Official Evasi0n7 v1.0.6 Jailbreak Tool for Mac OS X.
Download Official Evasi0n7 v1.0.6 Jailbreak Tool for Windows. If you're Mac OS X and Windows operating system user than follow the below guide to successfully Jailbreak iOS 7.0.6 firmware. Step 1: Download the Official Evasi0n7 v1.0.6 Jailbreak Tool from the above mentioned link. Step 2: Now, Connect your respective Apple iOS device running iOS 7.0.6 firmware on your Mac OS X and Windows. Step 3: Double click on Evasi0n7 v1.0.6 Tool to run, it must recognize your iOS 7.0.6 device. Step 4: After that, Click on Jailbreak button and follow the on-screen instructions. Step 5: Now, Once the Jailbreak process is completed, you will get the Cydia icon on your device Home screen, you can open it to setup your iDevice.